V1409. ALFRED ORDA, w.Ernest Lush & Josephine Lee (Pfs. ): Songs by Tchaikowsky, Arensky, Glière, Moussorgsky, Chopin & Dargomyzhsky. 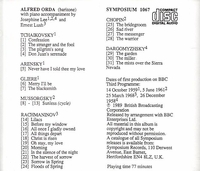 Symposium 1067, by arrangement with the BBC, recorded 1958-68. Very long out-of-print, Final Copy! "I do recommend all lovers of fine singing to make a point of hearing this [Orda Recital]. Invoking the names of Pavel Lisitsian from the past and Sergei Leiferkus in the present may help to suggest the type of voice. A fine darkish timbre, such as this, becomes particularly satisfying when allied to a bright projection and a healthily vibrant high register. That is what we hear, schooled in the old Italian method taught by the Cotognis: a true singer's art, and it never fails him." “Alfred Orda (full name Alfred Orda-Wdowczak, 1915–2004) was an outstanding Polish Operatic baritone and soloist who has lived in the UK for most of his life. A regular performer at the BBC Proms, especially from 1943 to 1964, Orda was born in Poland and in 1936 traveled to Milan, Italy, where for the next three years he studied under the direction of Alfredo Cecchi, a well known teacher amongst whose students had been Basiola, Granda and Ziliani. Early in 1940, Alfred was advised to leave Italy since war was imminent. He met up with other Polish students and refugees and made his way to France, eventually reaching England. In 1942, he made his first British operatic appearance as Valentin in FAUST with the Carl Rosa Company, and in 1943 he was engaged by Sir Henry Wood for the Promenade Concert Season in the Royal Albert Hall. With Sir Adrian Boult, and the BBC Symphony Orchestra he sang the Polonaise from 'Verbum Nobile' by Moniuszko. That season was the start of a rich succession of concerts and recitals for the BBC for over 25 years. A notice in the TIMES, regarding his Promenade Concert in 1944 described Orda as ‘a baritone with a freely-produced, resonant but agreeable soft textured voice who flung forth his melody as it might have been early Verdi, and at once captured the audience’. From 1945 to 1946 he toured with the Polish Opera Company in Canada, USA (New York, Chicago, Philadelphia and Detroit) performing main baritone roles in popular operas, continuing to receive glowing press notices. Between 1946 and 1947, Alfred Orda appeared as Silvio in PAGLIACCI with the New York City Opera and further engagements with Salmaggi Company at the Brooklyn Academy of Music and at the Carnegie Hall with the International Opera Company. In 1948 he attended auditions at the Metropolitan Opera House but was immediately recruited by Georges Hirsch, the Director of the Paris Opéra (who was in New York the time) to appear as Valentin in FAUST. The French press published glowing reviews on his début. In 1953 Alfred joined the Sadler's Wells Opera Company which he remained with for four years. In 1955 he shared a BBC studio concert with Dame Joan Sutherland in a Hugo Wolf programme, accompanied by the London Symphony Orchestra under Walter Goehr. In 1956 he sang in two broadcast studio performances of Gluck’s ALCESTE under Geraint Jones, among other soloists such as Flagstad, Raoul Jobin, Alexander Young, Thomas Hemsley and Marion Lowe. Further major engagements that year took him to the Royal Festival Hall in a programme conducted by Sir Malcolm Sargent. In 1957, due to personal reasons, Alfred Orda reluctantly turned down an invitation from the Royal Opera House to sing the role of Amonastro in AÏDA in the 1958/59 Convent Garden season. From this period, he concentrated on concert and recital work, mainly appearing as a soloist in the BBC Promenade Concerts.